Diamondflame was a scholar who gave up a lucrative career in accountancy for a more spiritually enriching one in the healthcare frontline. A self-professed Renaissance man with myriad interests, he is as likely to be found examining the facets of a diamond as he is in a sweaty ring, bareknuckle sparring. He has contributed over 500 reviews on Basenotes and posts regularly on Houzz, an interior design and decorating site. “Life is full of beauty. If only one knows where to look...” probably sums up his philosophy towards life. Little surprise fragrance appreciation came right up his alley. 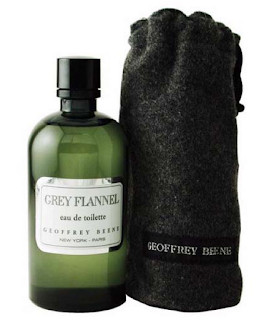 Geoffrey Beene Grey Flannel: Faded, But Not Forgotten. The opening is brutal - a straight jab to the nose that makes your eyes water with its pungent combination of citrus, petitgrain, clary sage and violet leaf notes. Dark green and unforgivingly bitter, the first few minutes will have you gasping in a chokehold till the boy in you cries out "uncle!" and taps out. The man however toughs it out till the scent relaxes its iron grip. The reward? A few great hours of complex olfactory aura that oscillates between soapy clean freshness, subdued green florals and the earthy dampness of mossy undergrowth. There is a certain underlying warmth, somewhat coumarinic in feel, holding the elements together by lending a touch of roundness to what could have been a highly angular composition. 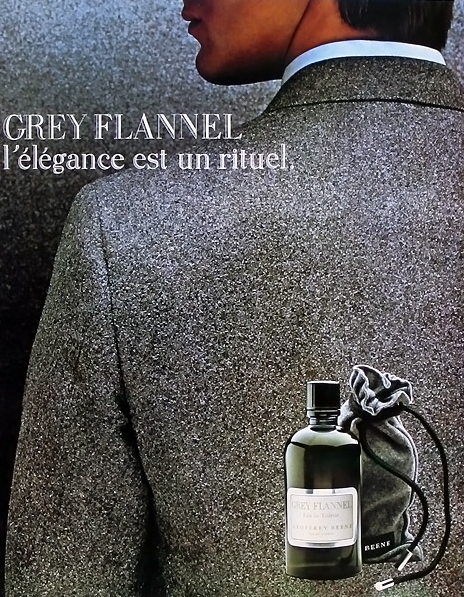 No doubt the ingredients are synthetic but the brilliant composition more than made up for it; Grey Flannel smells far better than it has any right to be, almost like an expensive niche or bespoke. Suave and rather distinguished, this masculine aromatic floral punches well above its weight. Grey Flannel fits elegantly like a well cut suit and offers no apologies for its sharply tailored virility. It bears none of the friendly opening notes that buyers, especially the younger ones, love in modern top-loaded fragrances. Since 1976 it continues to sport the utilitarian looks of a supermarket housebrand with its non-descript deep green glass bottle. In a field populated by calone bombs, sugary confections and cotton candies, Grey Flannel's shadowy green profile is the bitter shot of absinthe that distinguishes the men from the boys. Now that the average attention span of consumers has shrunk to that of three year-olds, Grey Flannel will likely remain a hidden gem, known only to the initiated few with discerning tastes. I pray it remains so, faded perhaps but never forgotten. I enjoyed the review. The funny thing is that I really love its opening: the rich leafy, orangey green neroli and petitgrain, anise and lemon oil recedes too quickly; it’s amazing.